For the 2000 novel, see Dune: House Harkonnen. The orange "guidon pennant" of House Harkonnen. A blue griffin is the emblem of House Harkonnen. House Harkonnen (/ˈhɑːrkoʊnən/ or /hɑːrˈkoʊnən/) is a powerful noble family in Frank Herbert's fictional Dune universe. The Harkonnens are featured prominently in the original 1965 novel Dune, and are also a major presence in both the Prelude to Dune (1999-2001) and Legends of Dune (2002-2004) prequel trilogies by Brian Herbert and Kevin J. Anderson. The Harkonnen bloodline itself extends throughout all of the original Dune novels. Frank Herbert wanted a harsh-sounding name for the antagonists of his novel, Dune. Herbert came across the name "Härkönen" in a California telephone book and thought that it sounded "Soviet" (it is in fact Finnish), which touched a nerve with Cold War-era readers. In earlier drafts of his novel, the lead villain was called "Valdemar Hoskanner". As the novel Dune begins, House Harkonnen is headed by the cruel yet cunning Baron Vladimir Harkonnen. Human life is of little consequence to the Baron or his nephews, the brutish Glossu Rabban and Harkonnen's heir Feyd-Rautha; both are the legal sons of the Baron's youngest demibrother, Abulurd Rabban, who had "renounced the Harkonnen name and all rights to the title when given the subdistrict governorship of Rabban-Lankiveil." The Harkonnen homeworld Giedi Prime itself is an industrial wasteland with a low photosynthetic potential, its once-rich natural resources exhausted and the environment fouled with industrial pollution. The Baron himself is "the direct-line male descendant of the Bashar Abulurd Harkonnen who was banished for cowardice after the Battle of Corrin", and House Harkonnen's return to power "generally is ascribed to adroit manipulation of the whale fur market and later consolidation with melange wealth from Arrakis." A millennia-long rivalry exists between the decadent Harkonnens and House Atreides of Caladan; the Harkonnens have essentially bought their status while the Atreides are related to the Emperor by blood, and the fact that an Atreides once had a Harkonnen banished for cowardice in ancient times is still bitterly remembered some 10,000 years later. The Baron's intent to exterminate the Atreides line seems close to fruition as Duke Leto Atreides is lured to the desert planet Arrakis on the pretense of taking over the valuable melange operation there. Harkonnen has an agent in the Atreides household and the secret assistance of the Padishah Emperor Shaddam IV; the Baron manages to kill Leto, and the Duke's concubine Lady Jessica and son Paul are left to die in the open desert. But this Harkonnen treachery sets in motion Paul's rise to power among Arrakis' native Fremen, and positions him as a threat to the Imperial interests there. The Baron later dies at the hand of Paul's sister Alia, and Feyd is killed shortly thereafter by Paul himself. Why did the Tyrant permit Family Harkonnen to squander so much of their last remaining wealth on such an enterprise? Perhaps for that very reason — to drain them. The cost in bribes and Guild shipping from the Ixian factories must have been astronomical. It is later said that "Gammu was Giedi Prime, a Harkonnen place ... They were rich... Rich enough to accomplish the secret installation of a no-room ... even of a large no-globe ... Bribes, third-party purchases, many transshipments ... The Famine Times were very disruptive and before that there were all those millennia of the Tyrant ... When the Harkonnens kept their heads down or lost them." Miles also notes in Heretics of Dune that the Harkonnen bloodline possesses "genetic lines tracing far away into the dawn times of Greek and Pathan and Mameluke." The Legends of Dune prequel trilogy by Brian Herbert and Kevin J. Anderson explores the origins of House Harkonnen, and later their feud with the Atreides. As the series begins, brave Xavier Harkonnen is just and honorable, and becomes close friends with Vorian Atreides. Ultimately he destroys his own family's reputation by killing the evil and corrupt—but perceived as a holy martyr by the masses—Grand Patriarch Iblis Ginjo. Ginjo's own political machine paints Xavier as a traitor, and the surname Harkonnen is abandoned by his immediate descendants. When Vorian tells Xavier's grandson (the first Abulurd Harkonnen) the truth, he takes his grandfather's name with pride. However, the close relationship between Abulurd and Vorian comes to an end at the Battle of Corrin, the battle that ends the Butlerian Jihad and founds the Imperium. Abulurd refuses a direct order from his commander, Vorian, to kill a multitude of humans enslaved by the thinking machines. Though he had only wanted to save innocent people, Abulurd is demonized by Vorian and labeled a coward. Abulurd's own brother Faykan Corrino exiles him from the League Worlds to the frosty planet of Lankiveil, where his descendants learn to believe they had been unjustly vilified by the Atreides family despite their noble deeds. House Harkonnen ultimately works its way back into the graces of the Imperium. The Prelude to Dune series, also by Brian Herbert and Anderson, explores the decades immediately prior to the events in Dune. This series establishes Vladimir's father Dmitri Harkonnen as a benevolent man who leaves House Atreides in peace. It is during Dmitri's reign that House Harkonnen grows in status and is rewarded with the governorship of Arrakis by Shaddam's father, Padishah Emperor Elrood IX. According to Prelude to Dune, Dmitri's first marriage to Victoria, who bore Vladimir, ended with a bitter divorce. Dmitri had two sons with his subsequent wife Daphne; Marotin, an intellectually disabled son who died at age 28 of natural causes, and Abulurd, eventually Dmitri's favorite child. A peace-loving man and the polar opposite of his older brother Vladimir, Abulurd is happy to relinquish the Harkonnen name, adopt his wife's surname "Rabban" and retire to Lankiveil to distance himself from the self-serving, underhanded, and violent actions of both his brother and of his own son, Glossu. Abulurd is later enraged when Glossu goes on a whale-hunting rampage, driving the Bjondax whales away from the area indefinitely and crippling the whale fur industry disastrously. When Abulurd later discovers one of his brother's illegal spice hoards on Lankiveil, he distributes it to his people; Glossu returns and strangles his father to death. House Harkonnen features prominently in the Dune computer games. House Harkonnen's color is red in this game. House Harkonnen's unique tank (the Devastator) is the most powerful and fearsome vehicle on Dune. Its firepower can obliterate infantry in a mere two shots, and even seriously damage heavy battle tanks and buildings. As such, however, the Devastator is quite clumsy and slow. One notable feature of this tank is the nuclear-powered engine: it can be set to self-destruct, destroying itself and anything nearby. The same event occurs once the Devastator is destroyed. The Death Hand is a super-weapon which is fired from the Harkonnen Palace. It can be launched to any location, causing mass destruction in the area and cannot be shot down. The missile itself, however, is largely inaccurate, and takes a long time to re-produce. Harkonnen Combat tanks have thicker armor plating than the other houses' tank models, yet they are also slower. The Devastator is identical to the previous version, except it will not explode violently when destroyed. In Multiplayer mode, House Harkonnen can train Sardaukars. Emperor: Battle for Dune The alliance between the Harkonnen and the Sardaukar is dissolved, but can still be forged. Harkonnen are still red. Harkonnen are also the only main faction unable to ally with the Fremen. ^ Brian Herbert (2003). Dreamer of Dune: The Biography of Frank Herbert. Macmillan. ISBN 9781429958448. ^ Herbert, Frank (1965). "Appendix IV: The Almanak en-Ashraf (Selected Excerpts of the Noble Houses): COUNT GLOSSU RABBAN". Dune. ^ Herbert, Frank (1965). Dune. ^ Herbert, Frank (1965). "Appendix IV: The Almanak en-Ashraf (Selected Excerpts of the Noble Houses): VLADIMIR HARKONNEN". Dune. ^ Herbert, Frank (1965). Dune. The Harkonnens won't rest until they're dead or my Duke destroyed. The Baron cannot forget that Leto is a cousin of the royal blood — no matter what the distance — while the Harkonnen titles came out of the CHOAM pocketbook. But the poison in him, deep in his mind, is the knowledge that an Atreides had a Harkonnen banished for cowardice after the Battle of Corrin. ^ a b c "Official site: Dune novels timeline". BrianPHerbert.com (Internet Archive). Archived from the original on April 13, 2012. Retrieved May 25, 2013. 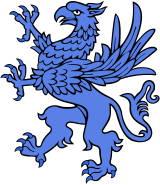 ^ The official seal of House Harkonnen bears the image of a blue griffin within Herbert's continuity. This was altered to a red ram for Westwood Studios' video game adaptations. This page was last edited on 1 March 2019, at 22:05 (UTC).